alaTest ha raccolto ed analizzato 10 recensioni su Samsung Evergreen. La media della valutazione per questo prodotto è 3.2/5, confrontata con la media della valutazione di 4.1/5 per altri Cellulari. Le persone rispondono positivamente alla usabilità e portabilità. In aggiunta, dimensione e performance ottengono buoni commenti. Abbiamo analizzato differenti valutazioni di esperti ed utenti, età del prodotto ed altri elementi. A confronto con altri Cellulari, Samsung Evergreen ha ottenuto un alaScore™ complessivo di 80/100 = qualità Molto buono. The Samsung Evergreen is a great eco-friendly messaging phone that AT&T has stuffed with unnecessary bloatware and extra data fees. 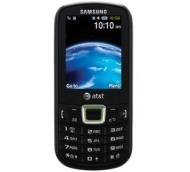 The Samsung Evergreen is an eco-friendly messaging phone in the midrange AT&T series with a good interface and onscreen features. Let's move on to the main review to learn about each of its features in detail. Absolutely HATE this phone. Shuts off on me always. Did get it replaced yesterday and the new one does the same thing. Cant wait to complain again. Tired of them saying its not their fault! I am on my 3rd phone of this model. I have had problems with the phone itself shutting off by itself multiple times everyday. I had it replaced and the next phone did the same thing several times over 3 weeks.